Mariell Bold Cubic Zirconia Wedding Cocktail Ring with Light Ivory Pearl Bubbles: 6"
* Mariell's ivory pearl and CZ bridal ring features a spray of multi-sized ivory pearls and brilliant Cubic Zirconia rounds presented in genuine silver rhodium. * This gorgeous ring is measures 1 1/2" h x 1 3/4" w and is available in sizes 5 - 9. 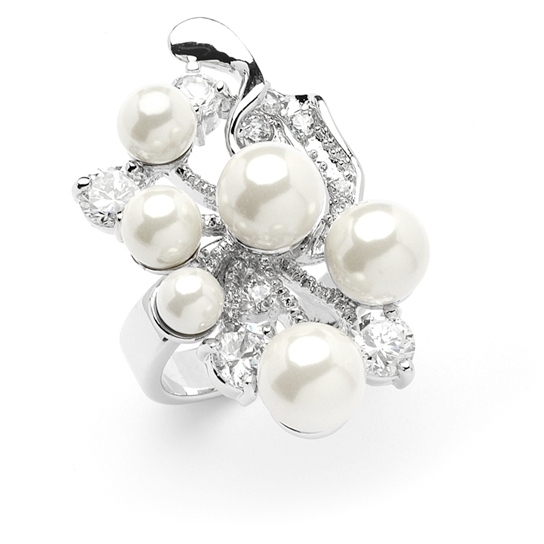 * Mariell's striking bridal ring is a delicate work of art with a multi-sized ivory pearls pearl set in an abstract floral pave CZ design. * This top-selling bridal ring also makes a great gift item. * Add this popular ring to your jewelry collection for brides, bridesmaids, mothers of the bride or anyone looking for a stylish fashion accessory.